*sigh* Another week, another mediocre set of results. Either we’re all getting really bad at reading matchups (quite possible!) or the League this year is full of teams who can not put together a decent run of games (also quite likely!). Duncan takes the honour this week of scraping a 10-5 out of the bag whilst everyone else languishes around the .500 mark. As a result, still no one wants to take command in the Prediction League. 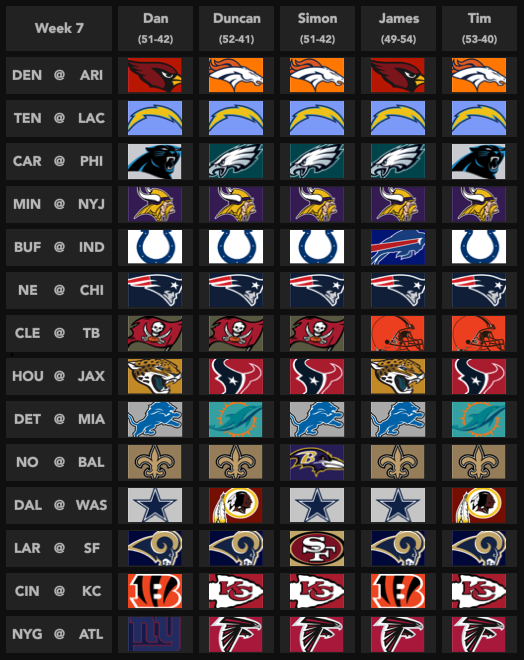 We are the NFC South of predictions! As always, let us know on Twitter who you think we have right, wrong, no idea on. We’d love to hear from you! Next story Anyone for a trap game?